Martez Carter and Trent Cannon are the talk of the town for the Skins and Jets matchup. (Over here at least). The New York Jets and Washington Redskins are set to face off in NFL preseason action on Thursday evening, so the Jets traveled down to Richmond, Virginia to prepare alongside the Skins. What could go wrong, right? Well, day one was not exactly a cakewalk. Tempers flared and a few heated moments were captured and flooded Twitter. Don’t let this deter you from the true story of these teams, however. 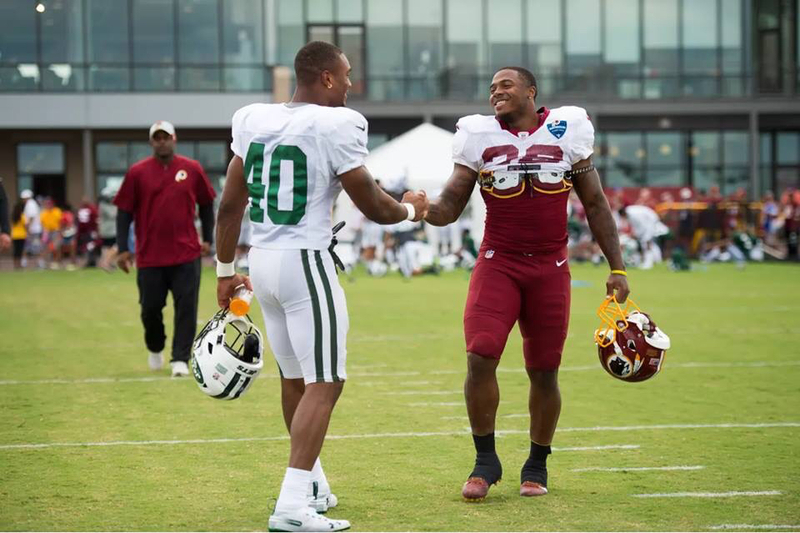 The Jets and Skins both have rookie HBCU talent in their line-ups at the running back position (and beyond for the Redskins), and while the brawl got things going, their talent and potential for these teams shouldn’t be overlooked. Trent Cannon, better known as “Boom”, is a former Virginia State running back selected by the Jets in the sixth round of the 2018 NFL Draft. Cannon’s time with the Jets so far has been impressive in camp, but he was tested on the big stage in-game one against the Falcons as a jack-of-all-trades. He had to balance his ball-carrying duties with the opening kickoff return, backfield catching, and the most challenging, punt returns. It’s safe to say he was a little outside of his comfort zone, as he muffed two punts but recovered one. The Jets aren’t panicing, though. Coach Todd Bowles expressed he is not giving up on Cannon. Rightfully so, as Cannon finished the night leading the Jets almost clear across the board in rushing stats with 11 carries for 40 yards with a long of 11 yards, averaging 3.6 yards-per-carry. Not bad for a rookie, right? Martez “Mr. Excitement” Carter is a former Grambling running back acquired as an undrafted free agent by the Washington Redskins. Carter has been putting the work in training camp, with veteran Chris Thompson predicting he will be a standout this preseason. Though Carter did not get to showcase his talents week one against the Patriots, there is a possibility that he will touch the field in week two. Washington suffered a crucial blow at the running back position with rookie Derrius Guice tearing his ACL, ending his season. Coach Jay Gruden expressed he has no interest in bringing in veteran running back talent, which makes sense considering the core already has more than enough talent to work with. The unfortunate blow to Guice gives Cater a chance to affirm Gruden there is no need to look outside for what he already has on his team. The Jets and Redskins play Thursday, August 16 in Landover, Maryland at 8 PM. Both teams certainly could both use the speed and explosion that both backs have. Washington has been riddled with the injury bug and already has two veteran running backs coming off of season-ending injuries from last year. Though the Jets drafted Cannon with an interest in the return game, they just lost Matt Forte and don’t exactly have the most star-riddled running back core. It’s safe to say that once the big lights come on, every move can, and will, count. While some will be looking for more sparks to fly, look past that for the potential explosive debut of Martez Carter with Washington and the redemption story in the return game for Trent Cannon with New York.